Although everyone knows that Winnie the Pooh can't make it without his famous pots of honey, as we discover in My Friends Tigger & Pooh: Super Duper Super Sleuths, he isn't above snacking on vegetables even when he doesn't have the honey to use as a dip. While in most circles, it wouldn't be very professional for sleuths to start eating the evidence, in Disney's adorable CG effort, it's just one of the perks when a case takes Darby, Pooh and Tigger to Rabbit's garden where a crash landed space rock has super-sized the vegetable to the point where even a Tigger can't lift one off the ground without a pulley. And it's certainly a good thing that our lovable detectives were taught to eat their vegetables! Soon after bites of celery, carrots, and broccoli, the super sleuths get superhero level super powers with Tigger becoming super strong, Pooh finding his vision to rival binoculars and Darby figuring out that she can soar through the air like the fireflies she envied the previous night. 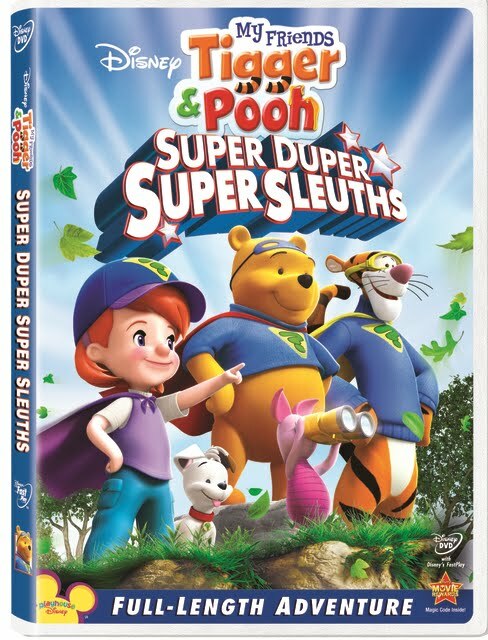 Entertainingly the DVD addresses themes like teamwork working as its own super power while emphasizing the importance of problem solving, honesty, and realizing that belief in one's own capabilities is far more important than wishing for a fleeting super power. And the full-length plotline serves up a delicious helping of good morals, good vegetables, good fun and good friends in addition to its never before seen bonus episode and game-like extra features. Featuring the same eye-popping, vivid animation on display in Mickey Mouse Clubhouse, this preschool through kindergarten targeted effort is nonetheless more successful from a narrative standpoint. While it still doesn't rival the thoughtful nature and intellectually superior style of the original series from Hundred Acre Wood, it nonetheless fits the promise of “Good Sleuthing” indeed and it just might make your kids ask for carrots the next time they see you preparing dinner.